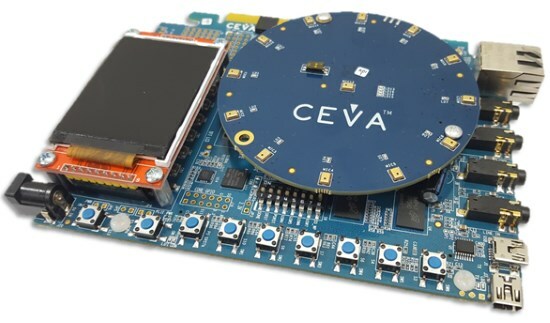 The CEVA “smart and connected” development platform is the ultimate tool for algorithm and system designers who want to develop and prototype audio and sensing solutions using real-time, full-speed silicon. The platform is built around a 500 MHz audio-and-sensing CEVA DSP chip fabricated using the IoT-centric SMIC 55 nm LP process, which also incorporates a rich integrated set of peripherals and interfaces. A multi-microphone daughter board with 13 microphones complements the high-speed silicon for development of sound‑pickup algorithms (for example, far-field voice pickup, beamforming, acoustic echo cancellation, de-reverberation and so on). Using the included DSP RTOS, the platform provides ample processing power for multiple functions running concurrently. This enables prototyping of real-world use cases, such as always-on sensing, local intelligence, and high-throughput multi-microphone processing, all of which are supported by the “smart and connected” platform. Because low-power signal processing is a key element in smart IoT device differentiation, the platform also provides real-time power measurement and display, which enables developers to optimize and power-tune their DSP firmware. The CEVA "smart and connected" development platform enables rapid prototyping and development of systems based on CEVA's audio and sensing DSPs.